Kamikodanaka 4-chome, Nakahara-ku, Kawasaki-shi, Kanagawa-ken 211-8588, Japan. All rights reserved. additional patents or patent applications in the United States or other countries. and/or licensed from suppliers to Fujitsu Limited and/or Sun Microsystems, Inc., including software and font technology. User. Please contact Fujitsu Limited or Sun Microsystems, Inc.
in the U.S. and in other countries, exclusively licensed through X/Open Company, Ltd.
registered trademarks of Sun Microsystems, Inc. in the U.S. and other countries. Fujitsu and the Fujitsu logo are registered trademarks of Fujitsu Limited. All SPARC trademarks are used under license and are registered trademarks of SPARC International, Inc. in the U.S. and other countries. Products bearing SPARC trademarks are based upon architecture developed by Sun Microsystems, Inc.
SPARC64 is a trademark of SPARC International, Inc., used under license by Fujitsu Microelectronics, Inc. and Fujitsu Limited. LOOK GUIs and otherwise comply with Sun’s written license agreements. Sun Microsystems, Inc. and Fujitsu Limited and the applicable provisions of the FAR and its supplements. or technology is provided. EXCEPT AS EXPRESSLY SET FORTH IN SUCH AGREEMENT, FUJITSU LIMITED, SUN MICROSYSTEMS, INC.
incidental or consequential damages, even if advised of the possibility of such damages. ARE DISCLAIMED, EXCEPT TO THE EXTENT THAT SUCH DISCLAIMERS ARE HELD TO BE LEGALLY INVALID. Kamikodanaka 4-chome, Nakahara-ku, Kawasaki-shi, Kanagawa-ken 211-8588, Japon. Tous droits réservés. Entrée et revue tecnical fournies par Fujitsu Limited sur des parties de ce matériel. brevets, d’autres lois sur la propriété intellectuelle et des traités internationaux. Les droits de propriété intellectuelle de Sun Microsystems, Inc.
brevetées supplémentaires aux États-Unis et dans d’autres pays. que ce soit, de la part de Fujitsu Limited ou de Sun Microsystems, Inc., ou des sociétés affiliées. technologies relatives aux polices de caractères. disponible; veuillez contacter Fujitsu Limted ou Sun Microsystems, Inc.
Cette distribution peut comprendre des composants développés par des tierces parties. déposée aux Etats-Unis et dans d’autres pays et licenciée exclusivement par X/Open Company, Ltd.
fabrique ou des marques déposées de Sun Microsystems, Inc. aux Etats-Unis et dans d’autres pays. Fujitsu et le logo Fujitsu sont des marques déposées de Fujitsu Limited. Toutes les marques SPARC sont utilisées sous licence et sont des marques de fabrique ou des marques déposées de SPARC International, Inc.
SPARC64 est une marques déposée de SPARC International, Inc., utilisée sous le permis par Fujitsu Microelectronics, Inc. et Fujitsu Limited. aux licences écrites de Sun. standard de Sun Microsystems, Inc. et de Fujitsu Limited ainsi qu’aux clauses applicables stipulées dans le FAR et ses suppléments. consécutif, même si ces entités ont été préalablement informées d’une telle éventualité. after the documentation set was published. preinstalled on your SPARC Enterprise M8000/M9000 servers. 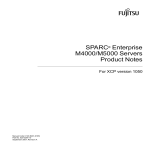 for your SPARC Enterprise M8000/M9000 servers. Installation information and README files are included in the patch download. Enterprise M8000/M9000 servers documentation set. it to a sales representative or a certified service engineer. Please include the title and part number of your document with your feedback. You can download the latest files of firmware at the following websites. 125100-06 and Solaris 10 8/07. is the Solaris 10 11/06 OS. a sales representative or a certified service engineer. These patches are not required for servers running Solaris 10 8/07 OS. This section describes known issues in this release. Caution – For dynamic reconfiguration (DR) and hot-plug issues, see TABLE 4. Domains using the ZFS file system can not use Dynamic Reconfiguration. supports new feature concerning the COD configuration. The XSCF does not support the Log Archiving feature. Do not use more than two cards per domain. Do not use these cards in an External I/O Expansion Unit. No more than two cards in an External I/O Expansion Unit. No more than eight cards in a SPARC Enterprise M8000/M9000 servers. sure to power off/on the domain. In case that Solaris OS is a single user mode, if you switch from the domain　console to the XSCF Shell, Solaris OS might be started up to multi-user mode. When you operate the single user mode for Solaris OS, don't switch from the　domain console to the XSCF Shell. which does not support dual XSCF Unit feature. displayed when you perform the firmware update. the browser, remove the plug-in or disable the pop-up blocking. This section describes hardware specific issues and workarounds. off, by using the main line switch or the circuit breakers on the distribution panel. TABLE 1 lists known hardware issues and possible workarounds. OpenBoot PROM (OK) prompt and reboot. a checksum error for the SG(X)PCI2SCSIU320Z SCSI controller I/O card. TABLE 2 lists known documentation updates. All DVD references are now referred to as CD-RW/DVD-RW. the PCIe connection and contains one or two I/O boats. PCI-X slots or six PCIe slots. TABLE 1-1 "Main Unit Specifications"
be mounted at this time. It describes the types of LAN port as "1000BASE-T/100BaseTX/100Base-T," which should be modified as "1000BaseT/100Base-TX/10Base-T."
should be modified as "2TB." M8000/M9000 Servers Site Planning Guide. This section describes software specific issues and workarounds. TABLE 3 lists known XCP issues and possible workarounds. at least 30 seconds before power-on. may occur and XSCF may reboot. number of character input on the XSCF Shell. XSCF Web, use XSCF Shell. "Undefined" may be displayed on the screen. the pop-up screen displays no data. Ignore the pop-up and close the screen. multiple log-in to the same host. operation, an error display pop-up appears. it is executed in Standby XSCF. is actually at "ok" prompt. behavior of the sendbreak(8) operation. or all of the XSB. operate the XSCF Web, "Permission denied"
user account will generate "Permission denied"
data, when a different user account is used. This error log can be safely ignored. processing" or "The page cannot be displayed"
Sync process has been continuously executed. operation within approximately 5 minutes. The snmp daemon might quit. XSCF failover might cause domain panic. before starting the DR operation. codusage details cannot be displayed correctly. before it switches, and "SHUTDOWN timeout"
may be stored in the error log. XSCF console, and XSCF may reboot. wait at least 30 seconds before power-on. domain may fail to be powered on. command may appear as if hang up. "Degraded," replace the I/O unit. TABLE 4 lists known issues and possible workarounds. diagnosis on a large M9000/M8000 domain. system boards might hang under heavy stress. Do not exceed 170 CPU strands. command to disable the excess CPU strands. This bug has been fixed in Solaris 10 8/07. Check for the patch 126670-10 for this defect. This message can be safely ignored. the console to lose characters during stress. opost onlcr crtscts" -f "9600"
This procedure is required only once. certain PCI-Express cards may cause a panic. corruption could occur due to a race condition. load after uncorrectable error(UE) panic. 1. Remove the following file. domain might cause a system panic. availability of a patch for this defect. Check CPU status on XSCF. on console on booting after CPU UE panic. card by PCI hot plug may not output. controller generates an invalid fault. replaced by using PCI hot plug. the same PCI slot card by using PCI hot plug. 416: Requested Range Not Satisfiable. by using Dynamic Reconfiguration (DR). display an incorrect faulty component. Check system status on XSCF. DVD/DAT drive between two domains. the domain exhibiting the problem. Check for the patch 128346-01 for this detect. X1027A-Z1 cards into one I/O Boat. No workaround available at this time. during a normal boot operation. all of the PCI slots. repeatedly after a boot net installation. plug operation with SP DR in suspend phase. start" failed with exit status 95. Expansion Unit may fail on XSB added by DR. This bug has been fixed in 125369-05. PCIe (X4447A-Z) card is present in a domain. This bug has been fixed in 125670-01. For Solaris 10 8/07, check for the patch 12774101 for this defect. Check for the patch 125166-06 for this detect. These messages can be safely ignored. Check for the patch 127750-01 for this detect. support hot-plug and should not be attempted. Check for the patch 127741-01 for this defect. Check for the patch 127741-01 for this detect. devices and "UNKN" for legacy PCI devices. an XSCF failover or XSCF reboot. Check for the patch 127111-02 for this detect. Use prtdiag -v for full output. Units, the domain console may hang up. Ctrl-q (the "Ctrl" key and the "q" key). 1. Log in to XSCF. if the value is non-zero. The example shows permanent memory on 00-2, with 1674 MB. 1. Delete any accounts named "admin". The following steps describe the case of upgrading to XCP1060. cabling or termination to setup RCI network, properly. For further information, please contact a certified service engineer. Note – Do not access the XSCF units via the "Takeover IP address". to use the XSCF serial connection to simplify the XCP upgrade procedure. 1. Log in to the XSCF#0 on an account with platform administrative privileges. help in case any problem occurred in this procedure. 3. Power off all domains. 5. Move the key position on the operator panel from Locked to Service. 6. Collect an XSCF snapshot to archive system status prior to upgrade. 7. The BUI on XSCFU#0 can be used to upload the XCP 1060 upgrade image. 8. Update the firmware by using the flashupdate(8) command. updated. If both banks indicate XCP revision 1060, proceed to the next step. Specify the XCP version to be updated. In this examples, it's 1060. 9. Confirm completion of the update. Confirm no abnormality happens while updating XCSF_B#0. contact a certified service engineer. 11. Turn off all of the server's mainline switches for 30 seconds. 12. After 30 seconds, turn the mainline switches back on. 13. Wait until XSCF firmware reaches the ready state. 14. Log in on to XSCFU#0 using a serial connection or LAN connection. regarding the standby XSCF are displayed. These error logs can be safely ignored. 16. Confirm and update the imported XCP image again. updated, and then XSCF#0 updated, again. When the firmware update for XSCF#0 is complete, XSCF#1 is active. 17. Log in to XSCFU#1 using a serial connection or LAN connection. 18. Confirm completion of the update by using the showlogs event command. Confirm no abnormality is found during the update. 20. Confirm switching over between XSCFs works properly. The XSCF unit switch between the Active and Standby states. remain lit, log in to XSCFU#0 using a serial connection or LAN connection. Confirm XSCF#1 is standby, and XSCF#0 becomes active. Confirm new log is not recorded since you checked on Step . Confirm a message XSCFU entered active state from standby state. Confirm a message "No failures found in System Initialization". 21. In case the takeover IP address is specified, confirm the IP address. 22. Power on all domains. 23. Log in to XSCFU#0 and confirm all domains start up properly. 24. Check that there are no new errors. abnormality is found, proceed to Step 25. 25. Move position of the key switch on the operator panel from service to lock. XSCF provides. And they supersede the information on the man pages. TABLE 5 lists known documentation updates. user option requires useradm privileges. network option requires platadm privileges. altitude option requires platadm privileges. timezone option requires platadm privileges.